Writing a limerick is not quite as easy as it looks. Most beginners get the number of syllables and the rhythm wrong. A limerick has a fairly standard structure and follows a pattern of short and long stresses. 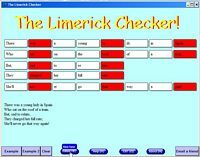 The Limerick Checker has a grid layout that will keep you right. Now you can produce a polished verse that will impress readers with your poetic craft skill. Once you have mastered the limerick you can move on to more complex poems and even song lyrics. Why would you want a limerick? There are some things best said in verse. Use fun lines in text messages or to flirt with or tease your friends by email. Last minute special occassions where you need some humor to break the ice. Limericks add sparkle to a speech and will amuse you friends at play or at work. Royalty free limericks at the press of a button. Use your limericks anyway you want. When you have created one, it is your own copyright. Sell them to greeting card publishers. Make your own greeting cards. Valentine, christmas, birthday, mother's day, father's day verses. Hours of endless fun for yourself and others. If you are into blogging, use them to amuse visitors and keep them coming back for more. Once your limerick is ready and edited, at the press of a button it can be sent to all the friends in your address book. Decided to give us his vote. Improving the limericks you wrote!" You can squeeze a limerick into a tweet as they tend to average around 140 characters. For a guide to do this try here How to Twitter a Limerick . NEW EDITION Get it Now! Download to your mobile.